#1 New York Times bestseller for 13 consecutive weeks! "Chambers has written one of the really significant American autobiographies. When some future Plutarch writes his American Live, he will find in Chambers penetrating and terrible insights into America in the early twentieth century." 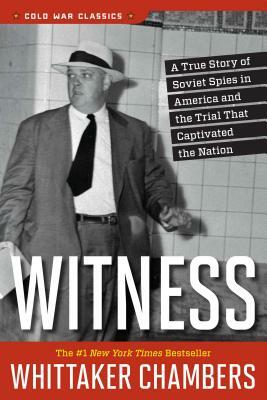 - ARTHUR SCHLESINGER JR.
First published in 1952, Witness is the true story of Soviet spies in America and the trial that captivated a nation. Part literary effort, part philosophical treatise, this intriguing autobiography recounts the famous Alger Hiss case and reveals much more. Chambers' worldview and his belief that "man without mysticism is a monster" went on to help make political conservatism a national force. Regnery History's Cold War Classics edition is the most comprehensive version of Witness ever published, featuring forewords collected from all previous editions, including discussions from luminaries William F. Buckley Jr., Robert D. Novak, Milton Hindus, and Alfred S. Regnery. Jay Vivian Chambers (1901 –1961), known as Whittaker Chambers, was an American editor who denounced his Communist spying and became respected by the American Conservative movement during the 1950s.